I’m deep in my sick viewing of soothing BBC period dramas. Pretty clothes, pretty period houses, fruity British accents, and very slow moving plots. But surely India can give us all that and more? Just replace the fruity British accents with classical Urdu influenced ones. And a Silly Sunday post is a nice easy way for me to get back in the swing of writing. Hmmm. Who would be a group of fabulous female friends that could solve murders in 1950s India? How about, back when they were in boarding school during the Independence movement, they were secretly working with the underground? But then Independence came, and they all had nice proper marriages to nice proper men and disappeared into parenthood and daughter-in-lawhood and so on. One of them married a very modern politically connected new money type. She hosts cocktail parties and goes to foreign films and is very perfect. But she and her husband have steadily grown apart, they are a political and social unit, but she knows he has a mistress on the side. Another had a young proper marriage into an old-fashioned very wealthy family. She and her husband are very much in love, her mother-in-law and grandmother-in-law dote on her, her children love her, everything is happy. But she is frustrated by having to hide it when she reads English newspapers, and not being expected to leave the house without her husband with her. Another one was the real rebel of the group, her father owns a radical newspaper and she worked with him for years. But then he had a stroke and her brother took it over and is cutting her out, keeping her to boring stories and research work. And then the fourth friend is Muslim, and a lawyer. She lives with her widowed mother, never married. We can start the series when the old chaiwallah in front of their school is killed. No one seems to care but them. They meet again at his prayer meeting, and go off to remember old times. And the next day, at the newspaper, the reporter friend sees a copy of the police report on the death and spots a clue, an old code they used to use with the chaiwallah to send messages to the underground. She calls the friends together and convinces them to investigate. They all find something they were missing, a sense of self, friendships, a life outside the home. And they solve the murder (along the way building a partnership with an attractive police officer who flirts with the lawyer, and a new hotshot reporter at the newspaper who seems to appreciate the female reporter). As the series goes on, personal issues go along with the murder mysteries. The modern wife finally leaves her husband and moves in with the traditional wife. The traditional wife slowly starts to push against traditions so that she can leave the house more easily and have some time for herself (inviting her divorcing friend to live with her is part of that). The newspaper friend gets more and more aggressive about trying to get her paper back (with the encouragement of the smart new reporter). The lawyer friend starts pushing more extreme cases instead of playing it safe (gaining confidence through her battle of words with the police detective). Most importantly, the clothes! And styling! 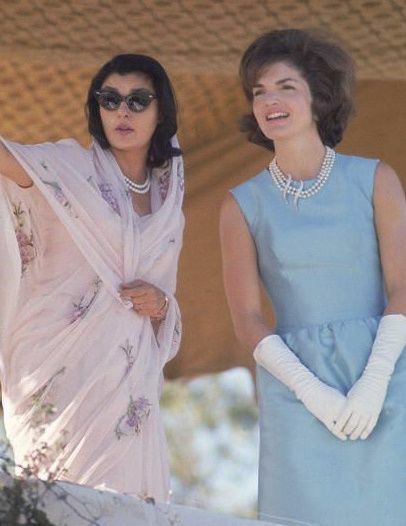 Our modern wife gets those amazing 60s suits and bouffants and occasional shocking chiffon sari. The traditional wife gets big jewelry and patterned bright saris, and nice natural hair. The reporter gets to wear the occasional pair of slacks, and has shorter hair with bangs. And the the lawyer wears perfect conservative cotton saris and leather handbags and proper hair (until she has to go undercover and dresses up and wows the police officer). I read a book on this family ages ago and it was so fun and should absolutely be one of those extremely expensive and soapy royalty mini-serieses that spans decades., like The Crown or Victoria. 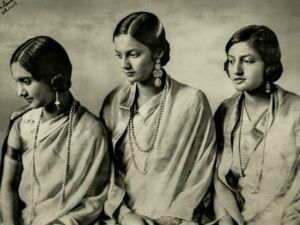 When Indira Devi was 18, only daughter of one of the most powerful royal families of Colonial India, she was taken with the rest of her family to the Delhi Durbar of 1911, a grand moment when all the royal families of India came together to pay tribute to the newly crowned king and queen of England. Indira came from a very modern family that had educate her and given her plenty of freedoms. But had also arranged her engagement in childhood to the crown prince of a royal house of equal importance. 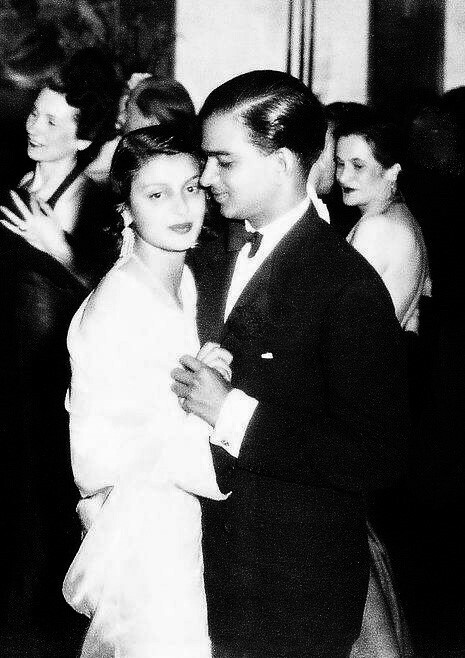 Indira at 18 met the young prince of Cooch Behar, only 25, and they immediately fell passionately in love. Secret meetings and letters continued through out the time at the Durbar. And then Indira took the brave step to send a letter of her own to her fiance, declaring she was breaking the engagement. Her parents found out about it when the fiance sent them a telegram “What did the princess mean by her letter?” Much sturm and drang happened, including her parents calling and threatening the young prince, who remained adament in his own love for Indira and refused to be warned off. It culminated in her parents agreeing to the match but not happily. Indira went to London where she and her prince were married quietly. She returned to his small kingdom where, unexpectedly, his older brother died and she became queen after all. But of a peaceful small simple kingdom, rather than the massive powerful one where she had been raised. Indira had 5 children in rapid succession, and then lost her husband when she was only 30. With her son being still a child, she became regent and ruler of the kingdom. All of her children were given a global childhood, traveling in Europe along with learning to ride elephants and shoot guns around the royal palace. All of them married into other royal families. Her oldest daughter married into the Tripura royal family and her grandchildren are the actresses Raima and Riya Sen. Her younger daughter went on to be the most powerful and important of her children. Gayatri, like her mother, fell in love very incorrectly and against the wishes of her family. Man Singh II of Jaipur became Raja at age 10 upon the death of his adopted father. The British “consultants” arranged for him to marry shortly after to a woman 12 years older than him. He had two children by her (the first when he was 17). His second wife was 5 years younger than him, their first child was born when he was 21 and she was 16. This was supposed to be the best for him, an older wife to guide him when he was a young man, and then a younger wife to keep having heirs and keep up with him as he aged. And both women came from the royal family of Jodhpur (wife 1 was an aunt of wife 2), a good ally for him and fellow Rajput ethnicity. Man Singh II himself was so much more than that though. He had a British education and was a war hero, and a sports hero, charming and sophisticated and intelligent. Two proper wives from proper Indian families didn’t really match with who he grew up to be. He first met Gayatri when she was only 12 and he was 19, staying at her family home while on the way to a Cricket match. They met again when he was twice married and only 27, and she was 20. They were a perfect match, both a combination of east and west, both raised royal, both young and charming and beautiful. If only he didn’t have those two wives! Meaning stunning talented intelligent Gayatri would be relegated to 3rd wife status in the household. Her mother was not pleased. But, like Indira before her, Gayatri could not be dissuaded and insisted on marrying the man she loved. They had an amazing life together, married in 1940, surviving partition together. Supposedly the riots in Jaipur were prevented partly because Man Singh II himself would take his sports car and park it in uncertain neighborhoods, keeping his visible royal eye on things. Gayatri could have stayed as a queen, doing things like founding schools and taking the lead in the modernization efforts of Jaipur that Man Singh II was determined to bring in his kingdom. And incidentally also making regular appearances on the global most beautiful and best dressed lists, having intentional photographers begging to photograph her and so on. But Gayatri decided she wanted all that, and more. And so in 1962, she ran for office, taking on the powerful Congress party. And won in a landslide, the highest percentage of votes cast in any election according to the Guinness Book of World Records. For years, Gayatri held the line against Congress. 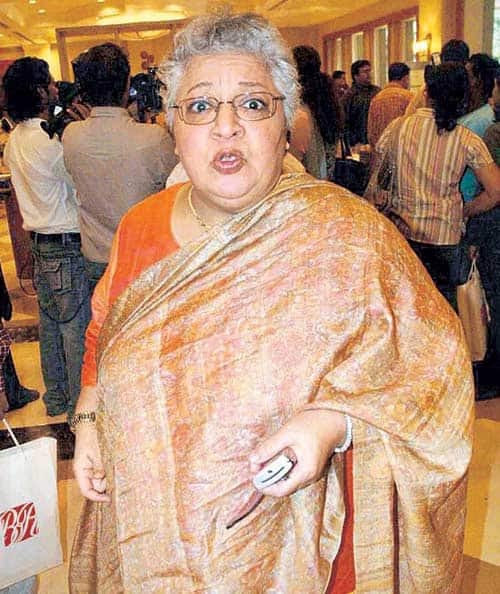 Her husband died in a Polo accident in 1970, and Gayatri kept fighting her elections and representing Jaipur. 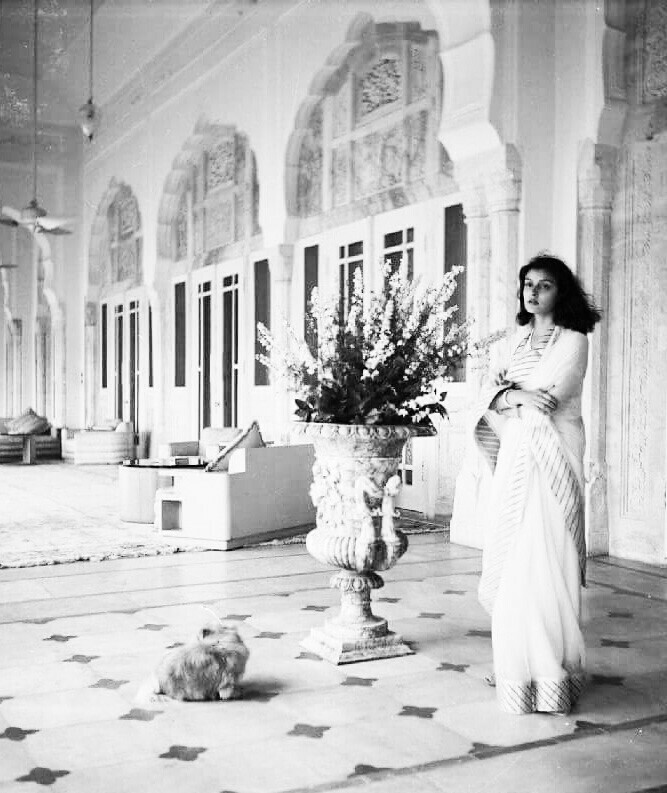 Supposedly she was one of Indira’s most hated rivals, partly because Indira was jealous of her effortless grace and beauty. During The Emergency, Indira had her thrown in jail for 5 months, during which time she was also diagnosed with breast cancer and was sure she would die there. She survived, and was released, to win yet another election. Gayatri retired from politics in 1976, and lived for another 30 years, outliving her only child by 7 years. Oh, and she also could fly a plane, and was best friends with Jackie Kennedy. HOW IS THIS NOT A MINI-SERIES ALREADY????? Well, this is easy. An old folk’s home in Bombay, held in trust for aging army officer’s and their widow’s. The characters are from all over India, lots of humor as they fight against each other’s stereotypes and prejudices. There is also a humorous servant of some kind. Ooo! Maybe a Hijra? There is a young developer who wants to buy the land, keeps coming around the old folks keep putting him off. Eventually of course he starts a romance with the young do-gooder social worker. By the second season, he is a regular part of the cast, and but of jokes among the old folks. By the third season, he is helping them scare of another worse developer. Yes, except I think I got cocky, I wrote this and then went to bed for another 4-5 hours. Anyway, glad someone read it! I really liked all 3 ideas (especially the first 2), but it isn’t getting much readership. I thought your “unlikely group of female friends” story was going to be the up-and-coming sixties actress group! Haven’t they stayed in touch for years? They seem ripe for the miniseries treatment! You could do something flashback-y, where the framing device is a present-day story about them being grandmotherly, but then a flashback to some youthful misadventures. Or they could solve crime using their special starlet skills, either in the present or the past. Or you could go the soap opera route, maybe someone gets a crush on a director then learns he’s married, etc.